Locomotive No. 30757 on RCTS Special at Eastleigh Station. England, 1953. Class S15 H-6-0 No 30840 passes thorugh Clapham Cutting, July 1964. 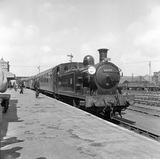 West Country Clas steam locomotive at Wadebridge, October 1949. Steam locomotive 'Tangmere', Faversham, Kent, 1958.